This is to serve as a reminder to all SME on the GST Registration, as we all aware, failing to register by 31st December, 2014 will be subjected to penalty by The Royal Malaysian Customs Department. About the eVoucher from SME Corp, you may log on : http://gst-evoucher.smecorp.gov.my/gst/ to check your company eligibility for the RM1000 eVoucher. If your company is eligible for the eVoucher, please check the mail box, to locate the eVocucher notification mail, which will lead you to the portal for the downloading process. 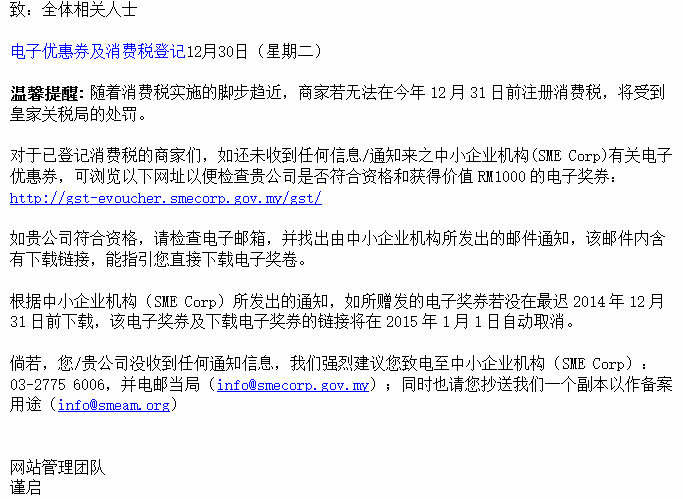 According to SME Corp if the eVoucher is not downloaded by 31st December 2014, the allocation and the link with the allocated eVoucher will be automatically cancelled on 1st January 2015.